At the bottom of the planet, a huge iceberg about twice the size of New York City is about to break away from Antarctica's Brunt Ice Shelf. "We're keeping a good eye on it," said Dominic Hodgson, a senior scientist at the British Antarctic Survey in Cambridge, England, who has been using satellite imagery to watch the ice shelf. "It's one of the most intensely monitored ice shelves in Antarctica. It's quite interesting — it's like a real-time science experiment." Scientists are watching the progress of a huge crack in the ice shelf that began growing recently after being stable for more then three decades. Dubbed Chasm 1, the rift has grown by 200 meters (more than 650 feet) in the past month, extending northward toward another big rift known as the Halloween Crack not far from a research facility maintained by the Survey. 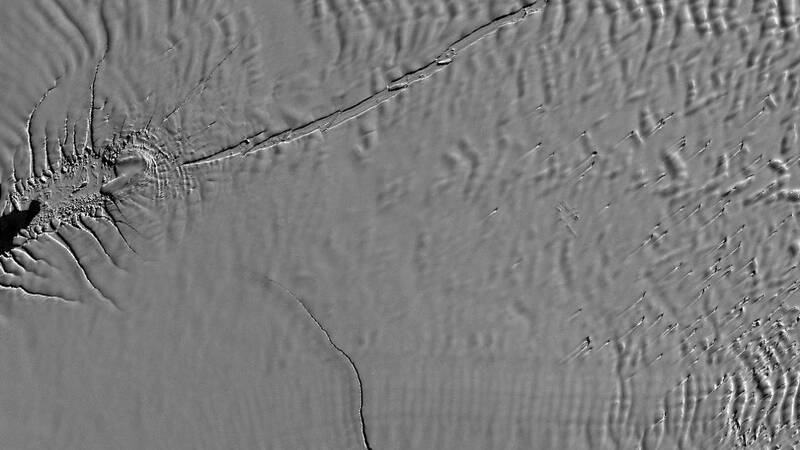 The converging cracks mean that the separation, or calving, of an iceberg covering about 660 square miles is "geologically imminent," Hodgson said. But, he added, "whether that means it happens next week or in a month's time, we really don't know." Is the looming breakaway of the iceberg direct evidence of climate change? It's hard to say. "This is part of what ice shelves do — they advance, break off a big iceberg, retreat and then advance again," said Christopher Shuman, a research scientist at the University of Maryland Baltimore County's Joint Center for Earth Systems Technology at NASA's Goddard Space Flight Center in Greenbelt, Maryland. But there's ample evidence that Antarctica's ice mass is shrinking as the region warms. A 2018 study found that the continent has lost more than 3.3 trillion tons of ice since 1992. "There have been a number of published studies that show there are ice shelves that are thinning," Shuman said. "They are still getting snow on top of them, but they're getting warmed and melted from below, which happens when the ocean waters around Antarctica become warmer." Whatever the cause of the calving, the iceberg would likely be the biggest to break off the Brunt shelf in more than a century, according to NASA. The biggest Antarctic iceberg ever recorded measured 2,200 square miles when it broke off the Larsen C Ice Shelf along the east coast of the Antarctic Peninsula in 2017. Hodgson said that once the iceberg breaks off, he and his colleagues are aiming to use ships to map the newly exposed seafloor around the shelf to help get a sense of the region's long-term stability.